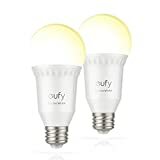 The eufy Lumos Smart Bulb by Anker is so great because it doesn’t require a hub of any kind to be used with Amazon Alexa or Google Assistant. Just screw in your bulb, use the free app to connect it to your Wi-Fi network, and you’re done. In fact, these bulbs are so good they’ve earned a coveted “Amazon’s Choice” designation. They sell for $18 a piece, but 2-packs are just $26 today on Amazon. That’s just $13 a bulb — it doesn’t get any better than that.